The instructors at both Powell Wellness Center and Culpeper Sport & Fitness make you feel like you matter. … I have a hard time keeping up with the more fit people but in the classes the instructors tend to the needs of each one of us without making us feel like we are doing things wrong. I don’t know how you do it but it helps so much to know WE matter and it is about us and not about the instructor’s fitness level. This workout for active seniors includes cardio and strength work. Balance, coordination, and flexibility round out this complete class. 30-minute core workout. Designed to fill the gap between your cardio and strength workouts with a focus on your foundation – the core. AXIS creates stability from the axis, or middle of your body, which is the basis of all movement, then layers on mobility, strength and finally, power. Step is back and it’s back to basics! Don’t know a turn step from a repeater? We’ll teach you the terminology. More experienced participants can add light hand weights to increase the intensity. Great for beginners and all levels. Learn the fundamental poses of yoga as you build strength, increase flexibility, and find focus. This challenging and dynamic class will invigorate the entire body through breath and movement. Ideal for anyone new to yoga. Designed to build strength and fitness through a variety of intense group intervals. Drop-in fee per session: $15. 4-pack: $55; 10-pack: $140. A 30-minute workout using your body weight, a stability ball and free weights to increase your core strength and tone your abs, back, hips and glutes. Fire up your metabolism and burn calories while you have fun dancing to the hottest country music. A short, sharp workout using your own body weight, resistance tubes, and weight plates to increase your core strength, tone your abs, glutes, back and legs as well as improving your posture that will inspire you to the next level of fitness while strengthening and toning your body. Saddle up for a great workout to increase muscular strength and cardiovascular endurance without heavy impact on the joints. Cycling strengthens legs and improves heart and lung function. A motivating soundtrack helps you tackle hills, flats, sprints and mountains. Cycling classes are offered in 30 and 50 minute formats. 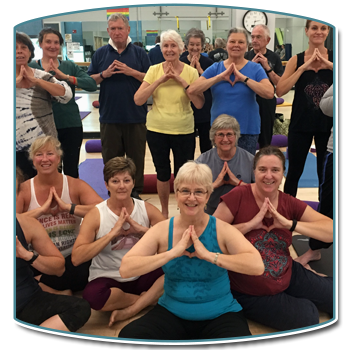 Learn to let go of stress and tension that can create pain and irritation in the body and mind, while increasing flexibility and focus. This class combines gentle postures with easy movement, breathwork and guided meditation. A blanket or covering is recommended for comfort. Inspired by the dances of the Pacific Islands, Hot Hula Fitness provides a total body workout for all ages and fitness levels. It incorporates easy to perform dance movements set to the sounds of traditional Polynesian drum beats, fused with reggae music, resulting in a modern, hip fitness workout with specific emphasis on the abs, glutes, quads, and arms. Takes heart-pumping music and your favorite kettlebell moves and combines them into calorie-torching fun! Focus on strengthening the core, abs, and lower back. Increase flexibility, range of motion, balance, and coordination. TheraBalls, Dynabands, and Power Rings vary and complement this workout. A fee-based group class that can take your training to the next level. Increase core and muscular strength, overall flexibility, balance, and coordination while creating long, lean musculature, utilizing spring resistance on the Reformer Bed equipment. This class is focused on helping you get and stay strong! It combines free weights, body weight and stability balls to challenge your muscles — especially your core. Open to all levels. 30 minutes of low impact cardio activity, 20 minutes of strength exercises (abdominals included), and 10 minute of stretching. Smooth gentle movements while seated. Strengthen the immune system while improving balance and stamina, and increasing flexibility with a gentle yoga movements. Great chair/standing class for Boomers and beyond if you are new to fitness or just want to get moving. Utilize resistance bands, soft fitness balls, light hand weights and your own body to move towards better health. The ancient Chinese practice of tai chi combines slow deliberate movements, meditation and breathing exercises, all done from a standing position. This is a challenging interval walking class: participants will walk at a 12-15 minute mile rate. Increase muscular strength, endurance, and overall flexibility, while learning relaxation techniques utilizing Hatha, Iyengar, and YogaFit postures. Yoga 1 refines the basics learned in Beginners’ Yoga. Yoga 2 flows at a faster pace and is suitable for those who have practiced other styles of yoga (not for beginners). This class fuses upbeat rhythms and music with easy-to-follow dance-style moves to create a fun, engaging, and dynamic workout. Zumba Gold is a great workout for beginners or active older adults. Kids 4-11 years old get the chance to be active and jam out to their favorite music. This class features kid-friendly routines based on the original Zumba choreography. We break down the steps, and add games, activities, and cultural exploration elements into the class structure. Relax with a float in an inner tube in our lazy river – enjoy an “ahhhhh” experience that’s also loads of fun! This is a shallow water exercise class is designed to give you a complete workout with a little added intensity. Each class includes cardio, strength, and flexibility. Designed for experienced pool exercisers. A mix of low-intensity and high-intensity moves in the water for an interval-style calorie-burning dance fitness party! This class is a total workout combining all elements of fitness: cardio, muscle conditioning, balance and flexibility. Non-impact, fast paced and fun! A Tabata style class using 20-second work cycles followed by 10 seconds of rest. The self-paced format offers a challenging option for all ability levels, with the potential to progress. Interval cardiovascular exercises and strength training in the water for an intense total-body workout. All fitness levels welcome. Intense upper and lower body workout in the deep section of the pool. Belt is required. Intermediate fitness level recommended; this class is designed for experienced pool exercisers. Develop strength and balance with this relaxing form of aquatic exercise. Perform yoga poses in water and enjoy the benefits of low-impact exercise. This warm water, low intensity class is designed to help participants with joint concerns, including stiffness, arthritis, fibromyalgia and back pain. Incorporates exercises to improve flexibility, balance, strength and joint range of motion. A high energy interval workout that works with and against the flow of the river. Intermediate fitness level recommended; this class is designed for experienced pool exercisers. A great introduction to water classes and the river. This class is an “at your own pace,” low-impact class. Using equipment, you will learn ways to walk, leap and bound through the water to increase strength and cardio endurance. Aquatic step adds a new challenge to every movement. Step in the water incorporates large dynamic moves that will improve your cardiovascular endurance levels and muscle strength. The water provides the perfect, safe environment for a fun, low-impact class that takes your fitness to the next level. Low impact water volleyball – fun for all fitness levels! *FitScripts is a FEE-BASED group class. A physician’s referral is needed to participate in the FitScripts program, which is designed for those who want to exercise but may have chronic conditions or physical limitations. Click here for more info on FitScripts. **Proper athletic attire and shoes are required for ALL fitness classes. For aquatic classes it is highly recommended that you wear water shoes. Hydration is essential for a safe and effective workout on the land AND in the pool. ***Schedule, classes and/or instructors are subject to change at any time without prior notice. For your safety and the consideration of others, there will be no admittance to any class five minutes after the class’s scheduled start time. ****Please use caution in the pool when crossing the river to get to the therapy pool. During classes held in the river, the current may be stronger than normal.